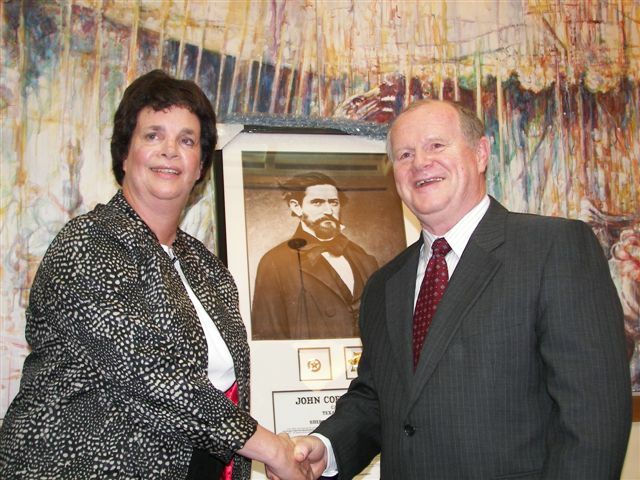 Hays County Historical Commission Chairman Kate Johnson sometimes worries that our county’s namesake, Texas Ranger John Coffee (Jack C.) Hays, is a vague, largely forgotten Republic of Texas-era figure, even in the county named for the legendary Texan. The trip was designed to re-trace Hays’ Gold Rush-era trek to San Francisco and culminated in a historic meeting of the county historical commission with San Francisco Sheriff Michael Hennessey. Three months after his February, 1850 arrival in the Gold Gate city, Jack C. Hays was elected its first sheriff, so the 21st Century commemoration of the Texas-California bond was once again firmly established with that office. Born in Tennessee in 1817, Hays came to Texas shortly after the 1836 Battle of San Jacinto, established himself as a legendary Texas Ranger over the next 13 years, then moved on to California for his career’s second major step. 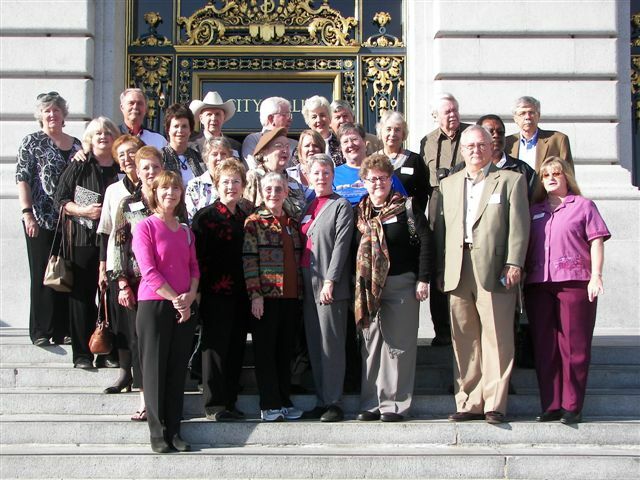 The once-in-a-lifetime visit by the Hays historians contingent to San Francisco was liberally sprinkled with unique features, not the least of which was the reinforcing of an even older link with Tennessee native Jack C. Hays’ history. Along for the ride were present-day descendants of the Hays family from Tennessee, Arkansas, Mississippi, and Louisiana. Making lasting friendships with all they met were Hays family representatives Betty Duckworth, Lola Estes, and Dea Windsor. County Chair Johnson presented San Francisco Sheriff Hennessey with a magnificent enlarged and framed photograph of the legendary Hays, complete with replica badges of the Texas Rangers and the early San Francisco Sheriff’s Department. A synopsis of Hays’ incredible career supplied the finishing touch to the presentation. Marshalling her emotions for what was an emotion-packed moment in Hennessey’s office, Johnson officially greeted the sheriff and all honored guests, expressing her appreciation for the fact all those present could be together on the special day and marked her feelings on what it all meant. With that, Johnson recalled the HCHC’s commemorative trip of the previous days and informed the sheriff and his enthusiastic staff of her group’s desire to honor the Hays trip to California with the special presentation. The resulting applause from both sides of the commemorating groups rang through San Francisco’s City Hall and at least some in the cavernous building might correctly have surmised that there were enthusiastic Texans in the place. Though the culminating visit at the city hall was a crowning jewel, there were decidedly other gems in this historic trip. Transportation for most of the trip that traced the Jack Hays path to California was by historically-restored rail cars from the mid-20th Century’s zenith of stylish train travel. From beautifully-appointed lounge cars to a high-visibility Vista Dome, chef-prepared dining delights, and a professional staff of seven, every participant’s needs (and lots of their wants) were met in unforgettable fashion. Trip participants were bused to San Antonio’s historic Southern Pacific Depot, where they boarded their three special cars and enjoyed their first dinner and overnight sleeper car experience before a pre-dawn coupling with Amtrak’s westward-bound Sunset Limited. Throughout the first day, the West came more into view, with the High Bridge crossing of the Pecos River, Judge Roy Bean’s Langtry outpost, and Alpine’s Davis Mountains-Big Bend Country perch sliding by. The train pulled into El Paso’s striking, historically-restored depot at sunset, its final car’s glowing red neon “California Zephyr” sign foretelling its final destination. Another (too brief) overnight in the sleepers and a 4:30 a.m. drop-off in Yuma, Arizona started a day that included coach service to California’s Anza Borrego Desert State Park, the barren, but striking pass area through which Jack Hays once rode. A walk down—and climb out of—the park’s narrow Box Canyon provided the trip’s toughest example of Hays’ 19th Century journey. And that night’s rest at historic Warner’s Springs provided the corresponding respite that Hays enjoyed on his own long-ago trip. Bused on to Los Angeles to link back up with their now-beloved train and staff, the group left an unusually sparkling morning in the city to pass through the thick smoke of fires still burning on its north side. Past that sobering reality check, the rail passengers enjoyed an unforgettable afternoon ride up the Pacific Coast, arriving that night in Oakland, a town Jack Hays helped develop in the second major chapter of his amazing life. Lodging at the historic (of course) Westin St. Francis Hotel overlooking San Francisco’s Union Square provided the base for the next day’s private San Francisco Bay boat tour out and under the Golden Gate Bridge. And yet another memorable moment came the following day with the commission’s visit to Oakland’s Mountain View Cemetery, where they paid their respects by pouring Hays County, Texas, soil over Jack C. Hays’ gravesite. Many eyes misted at the special moment. A 21st Century trip--in mid-20th Century rail cars—to commemorate a 19th Century Texas and California legend, the Kate Johnson dream to bring Jack C. Hays to life was accomplished with a flourish likely not to be equaled soon—if ever.